When contract interior specialist, Gradus, launched a new design-led, contemporary carpet range called “Urban Myth”, they took the opportunity to take on some ‘urban myths’ within their own community in nearby West Gorton, Manchester. Working in partnership with leading communities charity, Groundwork; Manchester City Council and The Guinness Partnership, Gradus provided an opportunity for the local community to have hands-on involvement in the creation of a pollinator garden; large containers filled with a diverse collection of pollinating flowers. The purpose of the mobile biodiversity initiative is not only to increase the biodiversity of the residents’ local environment, but also dispel the myth that people don’t value green spaces. 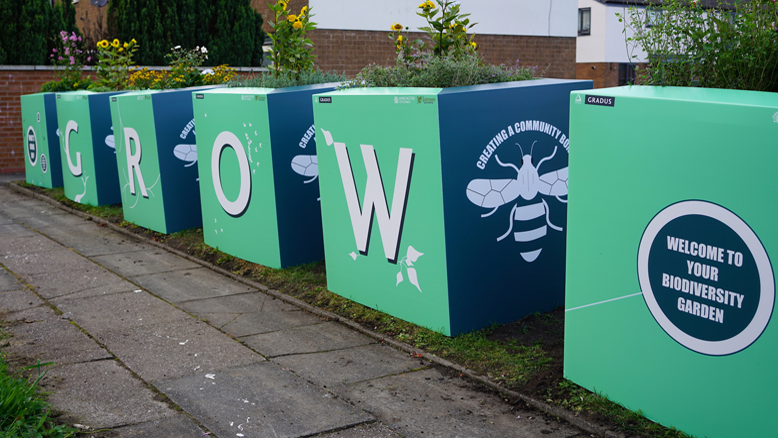 Anthony Roberts, Group Marketing Communications Manager, at Gradus explains: “There is a misconception that urban communities such as those here in West Gorton, don’t value the green space or green initiatives. However, as we’ve witnessed, that is far removed from reality. “A project like this helps to transform all-too-rare green spaces and by ensuring that a variety of plants are chosen, we can breathe new life in to these areas. We’re also able to create multi-functional, multi-purpose green spaces that appeal to all members of the local community. For more information on Urban Myth or Gradus’ complete carpet range, please visit www.gradus.com or contact Gradus Technical Support on 01625 428922.